I first became interested in glass when at the age of ten my parents took me to see the glass museum in Sandwich, Massachusetts. The images in the pressed glass seemed frozen in time. I work in various media, but glass continues to be intriguing, allowing one to expres different moods and ideas by using it in thin or thick form, simple or intricate patterns colorless or colored, cast or blown, and more. 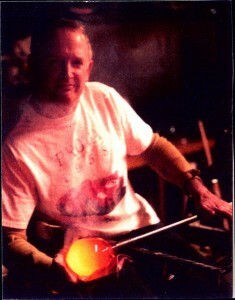 I observed glassblowing at UCLA while an undergrad, but didn’t begin classes until 1988 at Southern Illinois University at Edwardsville. Taking courses there for about 8 years, I learned how to build and repair equipment in addition to the basics of glass-working. I have attended Glass Art Society annual conferences over the years, including Toronto, Seattle, Seto (Japan), Amsterdam, St Louis, Pittsburgh, Tucson,and Corning. The conferences are a wonderful opportunity to meet and work withglass artists from around the world, and meet benefactors and gallery owners.